February 19, 2018—Even today’s school children know (I hope!) that the United States was on the “winning” side of World War II. (Sadly, war actually has no winners, just those who have not lost as much as the other side.) Some of the unsung heroes of that war, as well as all other modern wars, are the Merchant Marines, the civilian corps that carry fuels and cargo to the fighting forces overseas. Tampa has a permanent floating museum—the American Victory Ship and Museum—located at the piers where boarding of the cruise ships takes place. The Victory Ship was built in 1945 (making it my age); it is one of four fully operational WWII ships in the United States. Surprisingly, it was built in only 55 days; there was a rush to get cargo and transport ships built fast to supply U.S. troops sent to the Pacific front. 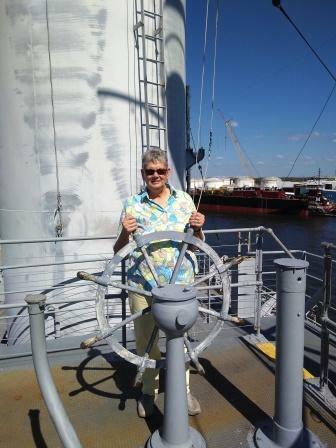 This particular ship saw service through WWII, the Korean War, and the Viet Nam War. The ship was brought to Tampa in 1999 and lovingly restored by volunteers, who still keep her maintained as a fully operational vessel. Jim, an old tar, longs for the sea. 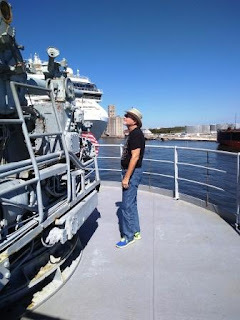 To satisfy his sea-dog yearnings, we try to tour ships wherever we find them, so yesterday, after a wonderful brunch at the Salvador Dali Museum with my Peru Group 65 friends, we headed to the ship to take a self-guided tour. I don’t think you can appreciate how big a 455'x109' cargo vessel until you start tramping all over it. This is not a luxury ship; there are no elevators. (I’m glad it was 80 degrees, but without any humidity.) We saw bunks, bedrooms, johns, and showers. We walked through the small galley that would have fed the entire crew. 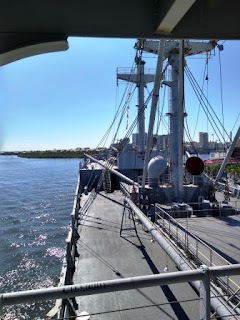 We climbed up beyond the quarterdeck to the gunnery areas and up to the flying bridge. Virtually all areas of the ship are open to tourists. I could never have been a sailor, for a lot of reasons. Jim, though, reminisces of his sailoring days, back in the mid-1950s, whenever he gets around a ship. I’m glad he had the opportunity to tour the boat. I’m just glad it was moored. I suspect I might get seasick if it were out on the ocean. Until the next ship…I mean, until next time.